Prism Comics is is a nonprofit organization (and amazing website) that supports lesbian, gay, bisexual and transgender (LGBT) comics, creators, and readers. I was recently contacted by Prism Comics' Paige and Kevin and asked if I would like to do the occasional review of kid and teen comic books for their "Color Commentary" feature... and I said yes! His dad (his parents have split) is supportive (bought him that dress), and tells the mom she’s over-reacting. She explains that life is hard enough, and she’s just trying to protect their son. Turns out Irma loves “boy” stuff as much as Sarah loves “girl stuff.” They hang out, watch monster movies together, and become friends. 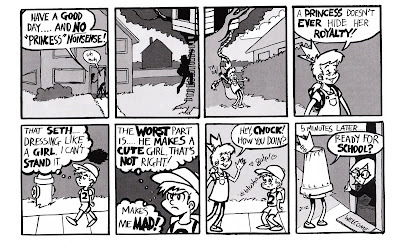 In the morning, on the way to school, Seth encounters Chuck, who freaks out about Seth wearing a dress and stuffs him in a trash can. Irma is incensed, and she digs into her costume box and transforms them into The Black Terror (Irma) and The Pink Pixie….err, The Red Bee (Sarah). The new superheroes face down the villain, and the outcome isn’t what you might expect. While like most comics on the first blush it looks like it’s just for kids, there was so much here for every reader. Deep issues and themes are at work in Christine’s comic book, smoothly inserted within the plot. 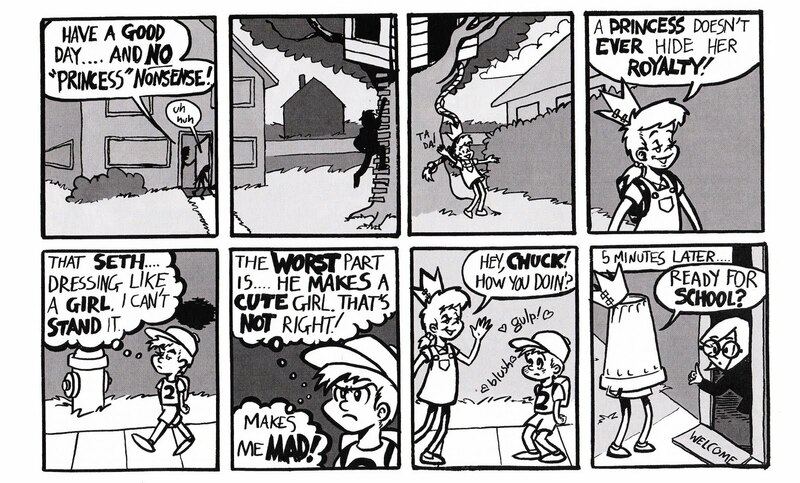 From a great analysis of Japan’s fascination with monsters to a plausible cause for why the bully Chuck is a bully after all, there’s so much to think about and love about this comic. Princess Sarah (Seth) is really likable, with her passion for being herself and not being deterred from that goal by anyone or anything. Irma is a great best friend, and her open-hearted acceptance of Sarah made me adore her. The mom’s objections don’t seem cruel to be cruel – she has her reasons to want Seth to conform, and we see her struggle. It’s nice that the opposing forces Sarah faces aren’t two-dimensional (though they’re drawn that way!) which makes the resolution much more satisfying. My only quibble is that I thought the color cover was overly pixilated with shading that felt amateurish – and that the cover might hold people back from reading this great comic book. In contrast, the black and white art inside felt more carefully executed, and worked really well in service of the story. The hand lettering helped carry the mood of each speaker, and facial expressions are deftly portrayed. There’s also a nice abstract way that backgrounds are dealt with that fills things in and makes the focus of each panel really clear. The panels throughout the book stayed the same square shape, eight panels per page, and I’d love to see Christine experiment more with the form - some panels of different shapes and sizes, and perhaps letting some moments impact visually rather than have dialog or text for each one. Overall, “The Princess” is a comic book that packs a punch: good characters that I cared about, interesting themes that I’ll be thinking about for days, and a fun style. I’ll be looking for more of Princess Sarah’s adventures, and more from Christine Smith! 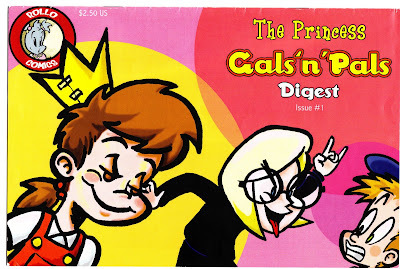 The Princess: Gals’n’Pals Digest Issue #1 © 2010 Christine Smith. Review © 2011 Lee Wind. My thanks to Paige and Kevin for the opportunity. 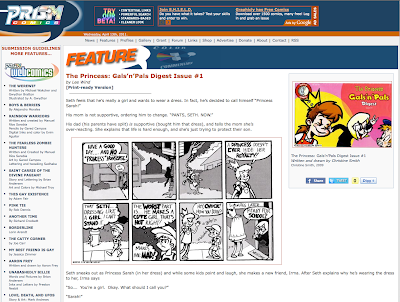 And please add your review of "The Princess" Gals 'n' Pals Digest Issue #1" in comments! D'awwww!!! I was having a really bad day, but "The Princess" finally made me smile. It's so adorable! Like a queer "Calvin and Hobbes." I have to admit the cast full of gay aspect is a bit over the top...but I love how it's for the most part a happy journey through kidland, and then you get smacked in the face with something really dark (biggest example: Sarah at the lake, overjoyed at finally being accepted; next panel, mother hearing about LGBTQ suicides on the radio. And Chuck's entire home situation.) It IS a very three-dimensional story. I'm not entirely sold on Irma, though. She's too generic weird. That is to say, her weirdness is as plot demands, and not stemming from the character herself. About the only other personality feature she has been given thus far is a crush on Chuck. She is just a flat foil character. Also, am I the only one who is noticing the odd scenery discontinuity? For instance, the motivational poster in the background of #49 is different from the one in #50. Intentional...?